“I never met a chocolate I didn’t like” reads one of the magnets on my file cabinet. It is part of the collection of t-shirts, mugs, and other “kitschy” items friends gift chocoholics like me with. Living near Hershey, PA, I can’t tell you the number of times I’ve ridden in the fake cocoa bean through the simulated ride at Chocolate World hearing the singing cows in the background while gliding through the fake bean roaster for an entertaining explanation of how they make chocolate. It is a carefree five-minute free ride ending with a Hershey rep handing you a sample of their latest chocolate product on your way out toward Hershey park. As we have traveled through El Salvador, we have seen some very limited cocoa growing and thought it would be fun to research its growing conditions, production, and laboratory work to control disease, as well as to look at the dark side of child labor involved in its harvest. Tangible evidence exists of the Mayans domesticating cocoa by making a drink of it and using it for trade with Costa Rica as early as 400 B.C. Explorers Christopher Columbus and Cortez introduced this unusual new drink to Europe. 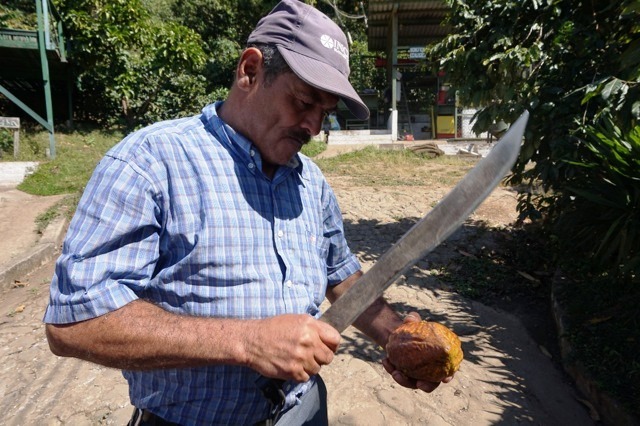 Its taste was so enticing it is believed to have played a part in the land grab to claim Central and South American lands for their European countries in order to cultivate more cacao. This is one finicky tree! 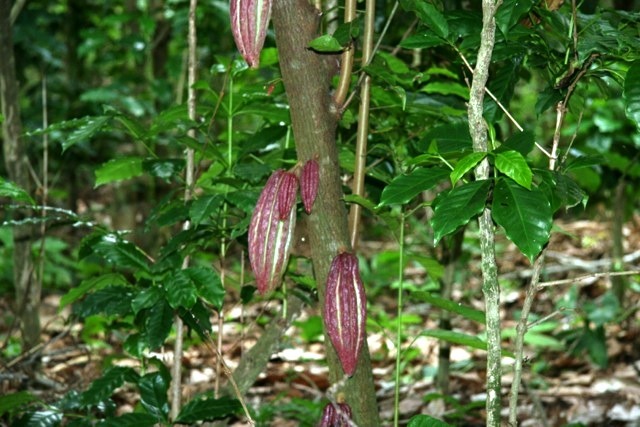 Cacao/cocoa trees grow only within a narrow strip located between 10 degrees north and 10 degrees south of the Equator. In most areas, other than Malaysia and Indonesia, cocoa thrives best when grown as an under-story planted in rain forest areas. Seedlings generally grow in nurseries. It takes three to five years for a tree to produce fruit. Trees can grow twenty feet tall and produce pods containing around forty beans. They thrive in temperatures between 18 and 32 degrees Celsius with rainfall requirements of 1250-3000 mm. well-distributed annually. Wind must be calm conditions; however, soil conditions can vary. Specific pruning methods must be used to enhance production. Generally there are one to two peak harvests per season. 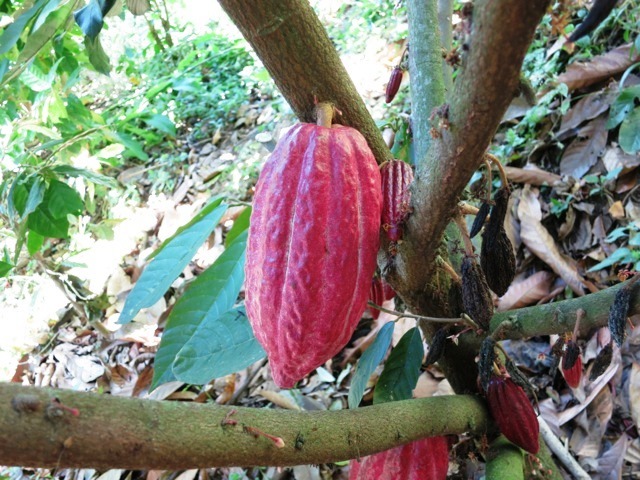 Most cocoa used for chocolate production is grown in small farms of less than ten acres. Midges pollinate cacao so farmers need to plant it in areas near other trees that host those insects. The tree itself is considered an evergreen. It can live 200 years but produces cocoa for only 25 years. The pods must be harvested using machetes in a selective way, ie. by hand one at a time. 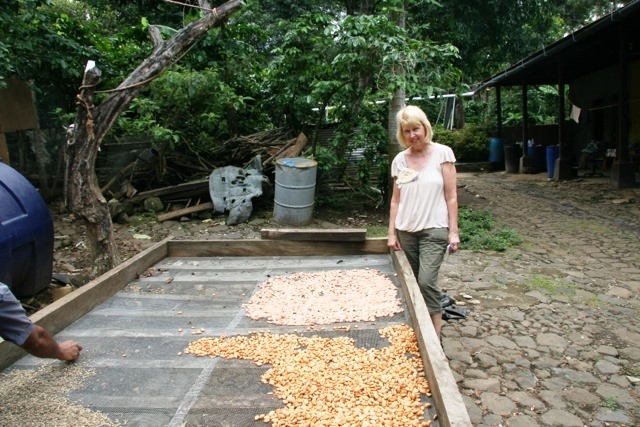 Seeds are fermented for six days in wooden crates and then dried in the sun. The highest quality cocoa seems to be grown in Ghana, Nigeria, and D’ivore (Ivory Coast) in Africa. (70% of the world’s cocoa comes from West Africa.) Because of the high demand for chocolate, Malaysia, Indonesia, and the Central American and South American countries of Costa Rica, Nicaragua, Ecuador, and Brazil are making efforts to increase production. El Salvador’s Minister of Environment and Natural Resources on April 25, 2016, allocated $23 million to a reforestation renewal program which includes cocoa and coffee. Honduras is also looking into doing this. In the March 1, 2016, Fortune Magazine article “Bitter Sweets” by Brian O’Keefe, the troubling topic of child labor in cocoa harvesting rears its ugly head. Mr. O’Keefe spent time in Africa interviewing young boys who were forced into child labor to work in cocoa farming. It is all part of human trafficking where these children are abused, unpaid, denied an education, and often injured or maimed due to the dangers involved in using machetes and carrying 100-pound bags of beans on their backs. Yet their families continue to live in poverty. Media coverage has helped attract attention to their plight and pressured U.S. politicians to tackle the issue with the chocolate industry which now pledges to reduce child labor in Ivory Coast and Ghana by 70% by 2020. The International Labor Organization estimates of the 21 million people working as victims of forced labor, 5.5 million are children. “It is clearly a complex problem that has its roots in poverty, and rural poverty no less. And if the problem is rooted in poverty, then the solution, in a way, is as complex as poverty eradication.” P. 59 The poverty drives the trafficking and exploitation. Facts from the 2015 Cocoa Barometer, a consortium of nonprofits, cite the wages for an average Ghana chocolate farmer in 2013-2014 as 84 cents per day in its growing season; in the Ivory Coast pay is only 50 cents per day. Given the high and increasing demand for chocolate, research universities and labs across the world are working to decrease the diseases that affect cocoa and to increase its production. Diseases such as Witches Broom decreased cocoa production in Brazil by 70%. Black pod devastated crops in West Africa causing serious losses in production. Finding ways to fight these diseases and help the trees become resistant to them is a big effort by these research teams. They also want to help farmers diversify their crops so they are not totally dependent on one cash crop. 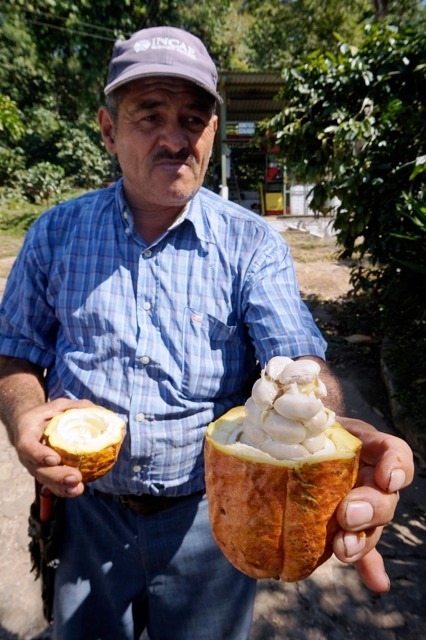 In addition to cocoa, these areas can grow fruits, woods, nuts, and timber. Sustainability of the small farmer is vital. As consumers of chocolate, it behooves us to follow the conditions under which countries grow, harvest, and produce cocoa. How are its workers treated? Do we hold chocolate companies accountable for allowing human trafficking and allowing the farmers to live in poverty? These are bittersweet questions for the sweet, tantalizing taste we chocoholics crave.